Please note, I do not keep a stock, as I offer most of my items in a choice of colours. Instead, I ask you to tell me the colour and pattern you want and then I knit it for you, so I need plenty of notice - 4-6 weeks for my larger shawls and 2-4 weeks for my smaller stoles and wraps. I realise this may be inconvenient for some, but at least you can be sure of getting what you want. Hand-knitted in 2-ply Shetland lace wool, this shawl measures 48” x 48" square and incorporates some traditional Shetland lace patterns eg ‘Tree of Life’ and ‘Cat’s Paw’ and takes over 80 hours to complete. It could just as easily be knitted in machine washable baby wool. Contact me with your preference. 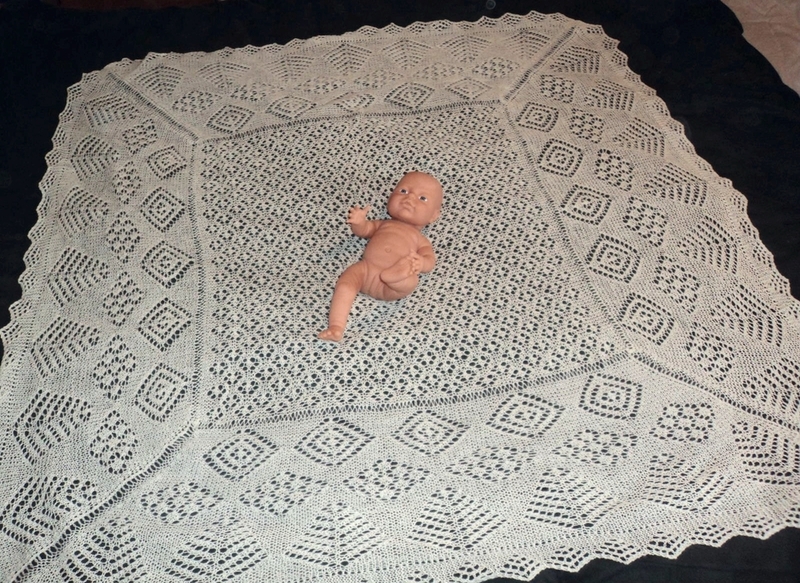 Hand-knitted in 2-ply Shetland lace wool, this circular shawl measures 48” in diameter, features the traditional ‘Old Shell’ pattern in the border and takes over 30 hours to complete. It could just as easily be knitted in machine washable baby wool. Hand-knitted in 2-ply Shetland lace wool, this circular shawl measures 48” in diameter, features a variation of the ‘Old Shell’ in the border with a scalloped edge and takes over 30 hours to complete. It could just as easily be knitted in machine washable baby wool. Hand-knitted in 2-ply Shetland wool, this circular shawl measures approx. 54” in diameter, features a variation of the ‘Cat’s Paw’ in the centre and a fan effect pattern in the border with a scalloped edge and takes approximately 45 hours to complete. It could just as easily be knitted in machine washable baby wool. Hand-knitted in 2-ply Shetland lace, this shawl measures 42" x 42" square and features a 'Diamond' pattern with scallops round the edge. A versatile shape, this shawl can be used in many different ways to keep your baby warm.